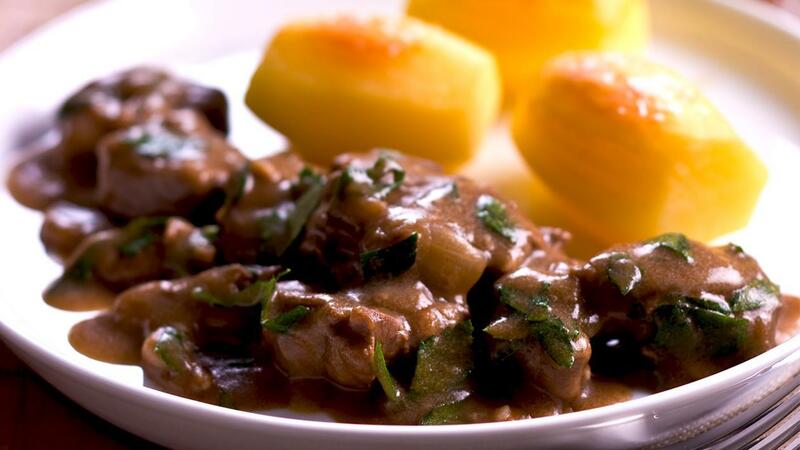 A classic British stew for those colder months. Heat the oil in a large pot and add the diced onion and garlic, cook until soft. Add the diced beef and KNORR Beef Booster and cook until browned. Pour in the stout and allow to reduce and cook until the meat becomes tender. Once the meat is tender add the KNORR Roux to thicken. Cut the potatoes into a barrel shape and place onto a large baking tray. Combine the KNORR Chicken Booster with the water and pour over the potatoes, place into an oven and cook until tender. Serve the beef in stout with the fondant potatoes. Keep the trimmings from the potato and deep fry until golden, season with KNORR Aromat and serve as a side of potato skins.